Phantom Regiment speared the World Class competition with “Spartacus” while the Blue Devils were “Constantly Risking Absurdity” as the defending champions. The Santa Clara Vanguard Cadets won gold in the newly formed Open Class after trailing Blue Devils B all season long. How did the battle in Bloomington play out? Let’s review this year’s top drum corps, award winners and special appearances. The competition for the Drum Corps International (DCI) World Championship was the closest ever in its 36 years of history with 1st and 2nd place separated by only 0.025 points. The Blue Devils dominated the season with an impressive 24 first-place finishes with The Cavaliers right behind them. But when the season peaked in Bloomington, Ind., on August 9, Phantom Regiment from Rockford, Ill., stood alone as the World Champion after an amazing upward battle. On Saturday, Aug. 9, 2008, Phantom Regiment stood alone at the top of the Drum Corps International Top 12 as the World Class Champion. Phantom Regiment started the competition in 4th place, fought its way to 3rd place in quarterfinals to 2nd place in semifinals and then finally to 1st place in finals. 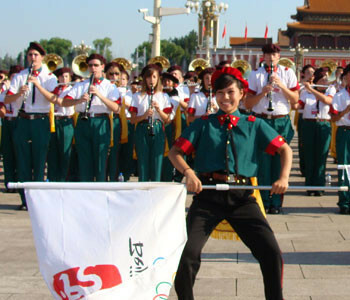 It was the corps’ second title overall. Previously, Phantom Regiment had tied for the DCI title in 1996 with this year’s 2nd place finisher, The Blue Devils from Concord, Calif.
Phantom Regiment also captured the Percussion Performance, General Effect Music and Music Ensemble awards as well as the Spirit of Disney award. This season marked Phantom Regiment’s first individual Championship win, as well as a capstone achievement to its previous performances of “Spartacus” in 1981 and 1982. According to Rick Valenzuela, executive director of Phantom Regiment, “Spartacus” was a show that was going to bomb or be an absolute hit. There was no doubt that the crowd was behind Phantom’s show. On finals night, its performance was augmented with calls of “I am Spartacus” coming from the stands and again during the awards ceremony later that evening. The defending DCI World Champions were the corps to beat in 2008. The winningest drum and bugle corps of all time with 12 DCI World Championships made it a fight to the finish. Although The Blue Devils led the pack going into finals, Phantom Regiment edged it out by the narrowest margin in DCI finals history (0.025 points). The Blue Devils’ 2008 production, “Constantly Risking Absurdity,” owes its inspiration to poetry about the treachery of navigating an artistic high wire. The Blue Devils dominated the 2008 drum corps season with an impressive 24 first-place finishes. The corps had lost only one other time at the Eastern Classic in Allentown, Pa., to The Cavaliers by 0.25 points. The Blue Devils took top honors with Brass Performance, Color Guard Performance, General Effect Visual and Visual Ensemble categories. This year’s program entitled “Perspectives” narrowly beat the Blue Devils B program of “Flight” by just 0.05. That’s an extremely close margin in an activity typically determined by tenths of a point. Jeremy “Spike” Van Wert, a former Santa Clara Vanguard tenor drum player and former percussion instructor for the Vanguard Cadets, shares his thoughts on this year’s battle for the Open Class championship. The Vanguard Cadets also took top honors in Brass Performance, Visual Performance and Percussion Performance. Overall, it won the Music Caption, earned second in the General Effect Caption and fourth in the Visual Caption. The Blue Devils B from Concord, Calif., had led the Open Class competition all summer long. When the DCI World Championships rolled around, it would come down to Blue Devils B and its “cross-town rival,” the Vanguard Cadets from Santa Clara, Calif., for the Open Class title. Leading after Open Class semifinals by a quarter of a point, Blue Devils B did its best to hold on to the lead. Its program, entitled “Flight” featuring original compositions by John Meehan and John Mackey, embodied the concept of leading from the front. However, it was the Vanguard Cadets’ program entitled “Perspectives” that narrowly slid past Blue Devils B by just five hundredths of a point. The Vanguard Cadets finished with a final score of 96.825 as Blue Devils B took the silver medal with 96.775. Jersey Surf finished in third with 96.050. In the past, Blue Devils B had only traveled to DCI World Championships once every few years. Since taking on the corps director position in 2004, Odello has worked to add resources and improve the overall touring experience. Blue Devils B has been to DCI World Championships four out of the past five seasons. Blue Devils B took top honors in the General Effect Music, Music Ensemble and Visual Ensemble categories. Jersey Surf won General Effect Visual. The upand- coming Citations, which placed 6th overall, captured the Color Guard Performance recognition. The Blue Devils B creative program was also recognized when it received the Spirit of Disney Award for Open Class. “We created a theme through narration and from an overall program standpoint that was engaging to the audience,” says Odello who was recognized as the Open Class Director of the Year. 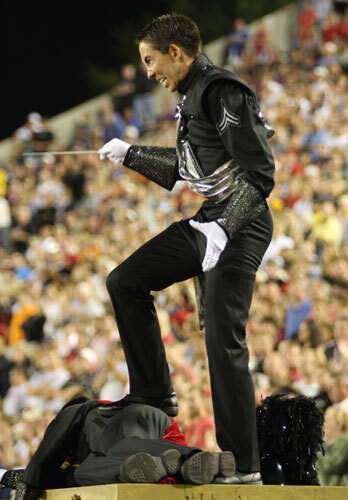 Mark Chambers, director of the Crossmen from San Antonio, was selected by his peers as the World Class Director of the Year for 2008. The Jim Jones Leadership Award is an annual award given to outstanding drum majors nominated by their directors and selected by DCI Hall of Fame members. The award recognizes excellence in corps leadership and conducting skills and includes a monetary scholarship for first, second and third place. This year’s top drum majors are Meghan Huber from the Crossmen and Blair Lezcano from the Velvet Knights. The Cavaliers Anniversary Corps, with 170 members, made a special appearance at the DCI World Championships semifinals to commemorate 60 years of history. “We decided to present glimpses, moments, rather than a truly authentic representation of each era, and the blend of old and new proved to be fun for both the audience and for us to perform,” says Chris Hartowicz, the anniversary corps director. Bringing the alumni together also provided an opportunity to create an endowment fund to ensure the longterm stability of the corps. At the 60th Anniversary celebration, The Cavaliers received pledges for $567,000 over the next five years. For a longer article about The Cavaliers Anniversary Corps, visit our“Web Exclusives, Magazine Extras” section. Gregory M. Kuzma, who simply goes by “GM,” is a freelance writer and the author of the book “On the Field From Denver, Colorado … The Blue Knights!” (www.gregorymkuzma.com), which highlights his 1994 summer tour adventures as a drum corps member.